So there I am, mindlessly flipping through the internet, when suddenly two words appear on my screen: Cloud Bread. Are you having the same reaction I had? Here’s a quiz: Does it sound sorta like this in your head? WHAT IN THE GREAT GOOD WORLD IS CLOUD BREAD AND HOW DO I GET SOME IN MY MOUTH? If you answered YES, then keep reading. 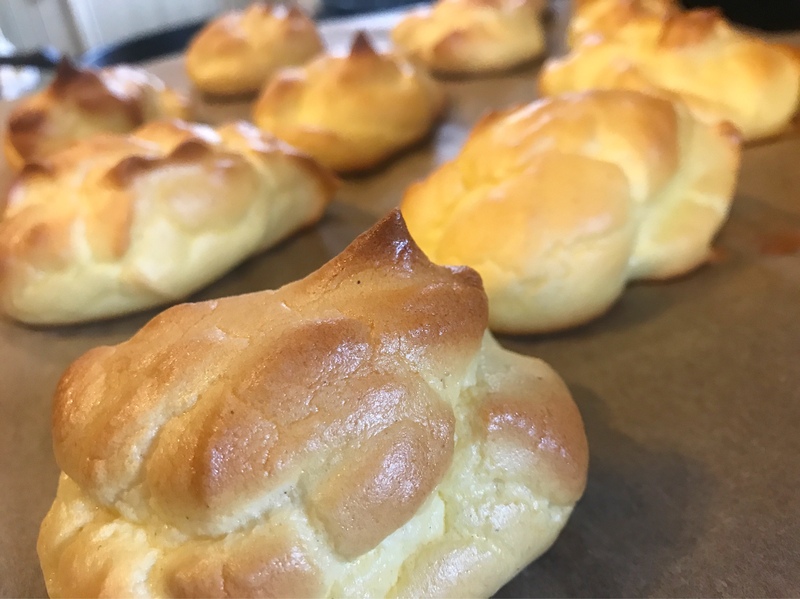 Cloud bread technically falls into the category of “Ways to eat bread without actually eating bread,” along with so many recipes with ingredients like chick pea flour, tapioca flour, almond flour, etc. And while that is texturally appropriate, it isn’t really what it tastes like. In my opinion, it should really be called Cloud Eggs. The bread tastes a lot like French toast — light, fluffy, cloudy bread texture, with eggy undertones. So I tweaked the recipe slightly to push it more in that direction and I think it’s pretty fantastic. Also? It is ridiculously easy to make. Putting it together takes less than 10 minutes, and baking is unattended. It’s easier than pancakes or french toast. So what are you waiting for? Make it for breakfast tomorrow! In a small bowl, mix the egg yolks, honey, yogurt, cinnamon, and vanilla, until smooth. In a separate bowl, whisk together the egg whites and baking powder until you have very stiff peaks. I recommend a hand mixer for this. Gently fold the yolk mixture into the whites, and carefully scoop the bread dough onto a parchment-lined cookie sheet, forming 12 rounds that are about an inch think. Bake at 300F for 25-30 minutes, until the tops are golden brown. Remove from oven to cool slightly, sprinkle with a little bit of sea salt (if desired), then devour them. My kids love them with syrup, my husband loves them with jam, and I love them period. Some people like more savory Cloud Bread and recommend additions like rosemary, oregano, and whatnot. So feel free to be creative! If you choose to make it, let me know what you think!